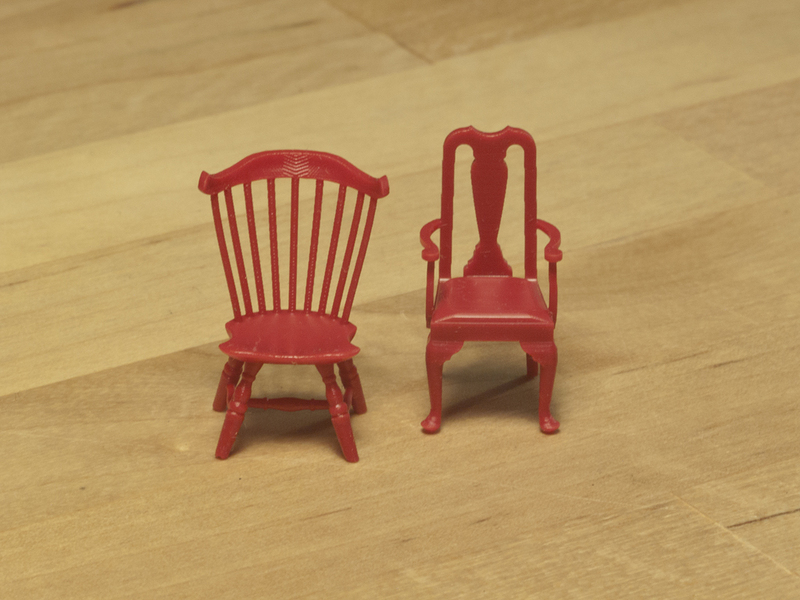 After I posted the pics of the tiny chairs from Pretty Small Things‘ Kacie Hultgren that I printed on my Form 1, John over at at B9 Creator said he would love to print them to let us compare the differences. Kacie agreed to let me pass on her STL files and John got to printing. He used, what was at that time their then about-to-be-released Cherry Red resin and, well, WOW! These prints are astounding, honestly better than any of the ones I was able to print on my Form 1. Now, I’m not saying the Form 1 prints were bad per se, the implications of being able to print these at all at home are still phenomenal; but the Form 1 chairs just didn’t come out as sharp as the B9 prints. At the time I couldn’t be sure where the source of the “fuzzyness” in the Form 1 prints stemmed from — machine? software? resin? Regardless, the 3D prints from the B9 were really, really good. The B9 uses a different type of exposure method from the Form 1: the B9 is projector-based, while the Form 1 is laser-based. This means that the B9 will take up a bit more vertical workspace than the Form 1, to accommodate the distance needed from the projector to the build plate. Due to the exposure difference, they each use a different formulation of resin. Form 1 resin in the B9 has not worked, however B9 resin in the Form 1 has (and when mixed with Formlabs resin, resulted in sharper details than Formlabs resin alone). There is a bit of a price difference between the B9 and the Form 1: an assembled B9 being more than a Form 1. The build size is roughly the same between the two, however at it’s finest resolution the B9’s build size drops to only about 1/4 that of the Form 1. The Form 1’s highest resolution is twice as fine as the B9’s. On paper. I’d say that the differences in resin make the resolution differences moot in practice, unless you use a different resin in your Form 1. Users have had success in “burning out” B9 resin, though not Formlabs resin. This means, simply, that if you 3D print items like rings or other jewelry with a B9, you’ll be able to put the 3D print directly through a normal mold-making process that heats the item for an extended period, leaving a mold you can cast into. If the resin doesn’t burn out properly, you get bad casts. I’ll post about this later, as I have some examples. If small, super-detailed things are what you are 3D printing, and you can afford it, the B9 is one to look at. If you’re willing to try to mix up your own hybrid resins, I’d at least look at B9’s resin as a base. Since originally getting the prints from John and writing up my thoughts, several things have happened. I was having problems with my Form 1 that caused me to exchange out my original printer with another, and another. In the end, it was discovered that my Form 1 was in a room that was getting too cold for the resin to work properly! I have since moved my newest Form 1 into a room that stays around 68-degrees Fahrenheit, and everything I’ve printed has come out perfect. Since first tests, Formlabs has released both gray and white resins, which can hold detail a little better. However, as with the clear, I’ve not gone back and re-printed the chairs using either of these resins. I have not gone back and re-printed Kacie’s chairs to see if some of the “fuzziness” has gone, either due to temperature problems or with a non-clear resin. While I suspect that I will get better prints than I initially had, I also know they won’t be as sharp as the B9… unless I want to mix a hybrid resin, or until Formlabs releases a resin that holds more detail. Also, shortly after I got these prints from John, Make Magazine started assembling their test printers for their latest Guide to 3D Printing, and B9 was one of them (and Kacie took part as well). You can see their guide for a more thorough comparison. Hi, what is the size of the chairs? It’s hard to guess from the photographs. They look great! Hi – I added a new gallery of macro shots, showing them sitting next to a US penny and US dime. I couldn’t find my small ruler to put in the shot, and the battery in my digital calipers is dead :-\ Hope this helps!